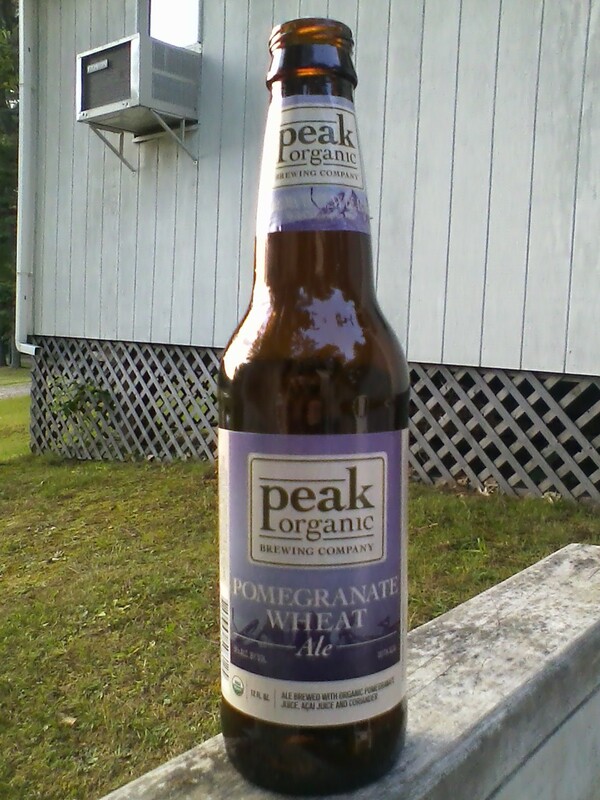 Peak Organic Brewing Company is one rad brewing company located in Portland, ME. I reviewed their IPA previously, which is divine in my opinion. The same cannot be said for the Pomegranate Wheat Ale, but its not too bad. Unless you don't like pomegranates, then you are fucked. The Pomegranate Wheat Ale sounds like something out of a whole foods / co-op / commune produce section, as it is brewed from the likes of pomegranates, acai berries, and coriander. Acai berries are hotter than Justin Beiber right now, and health nuts will espouse its virtues and benefits without losing a beat. Coriander is just plain old Chinese parsley, or cilantro, or something like that. Both of them show up in this beer, and you can taste them. But you can especially taste the pomegranate. I happen to like pomegranates so I liked this beer OK. If you don't like fruity beers then you aren't going to like this one either. Given that it was a wheat ale and unfiltered, it was still pretty easy to drink, and it was quite refreshing. And it doesn't hurt that it is 6.000000% ABV (that was an improper use of sig figs, I know). I got this beer as part of a Peak variety pack ($12.99 for a 12 pack score!!! ), which included three of their standard beers plus a "brewer's choice" selection. When I saw that the brewer's choice was this pomegranate beer, I said "Oh OK we'll see how this is" and I was pretty much OK with it. I bet some dudes got pissed upon seeing this fruity beer though and threw them at their television sets. The lesson is that you should not surprise people with beer selection, especially if they have already been drinking. Because we all know that drunk people are unsafe, raging, violent people. Like the Visigoths. Or the Swiss. I don't think I would get this pomegranate wheat ale again, but since it came as part of a super duper cheap variety pack, I was OK with it. This variety pack was purchased in the state of Maine, which I have found to have super awesome beer deals (and no hefty deposits on growlers!) so you probably won't find this kind of deal outside of The Pine Tree State.